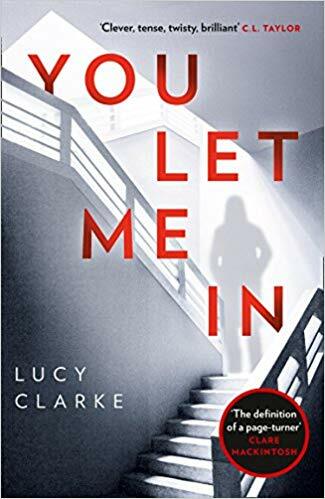 ‘You Let Me In’ is the latest book by Lucy Clarke. Nothing has felt right since Elle rented out her house. There’s a new coldness. A shift in the atmosphere. The prickling feeling that someone is watching her every move from the shadows. Maybe it’s all in Elle’s mind? She’s a writer – her imagination, after all, is her strength. And yet every threat seems personal. As if someone has discovered the secrets that keep her awake at night. As fear and paranoia close in, Elle’s own home becomes a prison. Someone is unlocking her past – and she’s given them the key. When I should have been settling down for the night, I started this book and was unable to put it down, as I couldn’t see properly, I was that tired. 2018 has presented some great thrillers, but I have to say that ‘I Let You in’ has been my favourite thriller of the year. It’s grippy, riddled with tension and suspense throughout and with a very unreliable protagonist that makes the reader on edge. The story is mostly seen in the first person, of successful author Elle Fielding, who’s struggling to write her second book. Life is far from what she expected, after the success of her first novel. Having built her dream home in Cornwall and now going through a divorce, she’s lonely and stressed with her looming deadline. To take the stress of her financial worries, she rents her house out for Air BNB, but when she returns to her home after a stranger living in her house, she’s convinced that something is different. Right from the offset, this book really pulled me in. Elle is a dark and troubled woman, who has quite an imaginative mind, that constantly leaves the reader in doubt. As strange things happen and Elle begins to doubt what’s real and what’s fiction, she lures the reader into her unstable mind. The story is cleverly written, with smaller stories weaved throughout with suspicious characters that make for interesting reading and the setting is atmospheric and bleak. The story also gives an great insight into the role of an author, the pressure of deadlines, the facade of social media as well as the solitary of the job. A tense and creepy story that gets right under your skin, ‘I Let You In’ is a fantastic psychological thriller that will have you double checking your doors and windows before bed! You can buy You Let Me In from Amazon and is available to buy from good bookshops.